The Palazzo Hotel Las Vegas is an all-suite 5-Diamond resort situated on the Las Vegas Strip between The Wynn to the South and its sister property, the Venetian Hotel, to the North. Directly across the street you will find the huge Fashion Show Mall, as well as another casino hotel, Treasure Island, from which you can take a tram to the Mirage hotel. The Mirage is home to the Siegfried and Roy Secret Garden & Dolphin Habitat, which is perfect for children. For Vegas bound families, the Italian themed Palazzo and it's sister property, The Venetian, are a real find. Both hotels offer over-sized hotel rooms, about with kid-friendly attractions, and they offer the additional advantage of proximity to a whole cluster of other very family-friendly fun things to do. If you've ever dreamed of visiting a galaxy far, far away. Now's your chance. Step into a brand new virtual-reality experience with this whole-body, fully immersive adventure, where you, your friends and family can get physically inside the action. This virtual reality experience combines interactive sets and real-time effects for a truly innovative experience that any Star Wars fan will love. Adding to the undeniable charm of the Grand Canal Shoppes are the not-to-be missed street performers. Follow the crowds to St. Marks Square for free outdoor entertainment that will delight the whole family. "Streetmosphere": These classically trained singers, actors, and musicians perform five times daily. Show times are 1 p.m., 2 p.m., 4 p.m., 5 p.m., and 6 p.m. The Venetian Trio: The Venetian Trio performs every night between 6:30 p.m. and 10 p.m. 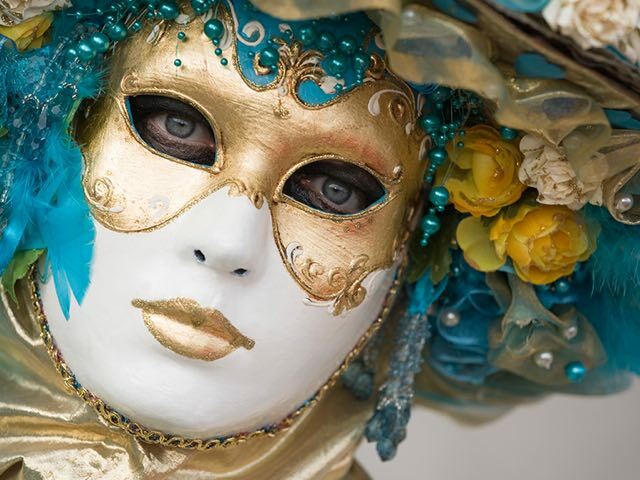 Living Statues: See them either in St. Marks Square between 10 a.m. and 6 p.m. or near Ann Taylor between noon and 8 p.m. In addition, you never know when, in the course of meandering along the cobblestone walkway and taking in the sights, you might be unexpectedly greeted and entertained by musicians, stilt walkers, and other street performers. No one is too young or too old to take a ride along the Grand Canal in an authentic Venetian gondola complete with a singing gondolier. You can choose either an indoor ride or an outdoor ride. The hours for indoor rides are 10 a.m.-11 p.m. Sun.-Thurs. and 10 a.m.-midnight Fri. and Sat. Outdoor rides operate daily (season and weather permitting) from 11 a.m. to 10 p.m. The cost is $21 per person. Optional photo packages are $22 and up. Whether or not you actually encounter any celebrities during your visit to Las Vegas is hit or miss. But for anyone visiting Madame Tussauds Wax Museum at the Venetian Hotel, it is a safe bet that you have the opportunity to see lifelike re-creations in wax of more than 100 famous people. The museum is open every day from the year starting at 10 am. Closing times vary so check with the hotel. 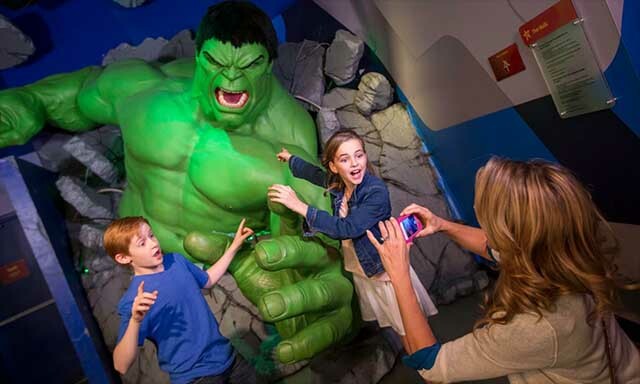 Children age 3 and under are admitted free and Nevada Residents receive 50% off. You will have many opportunities to photograph your children hanging out with their favorite celebrities! The Palazzo pool area consists of no less than seven pools and four hot tubs. The surrounding fountains and foliage provide a relaxing retreat that is perfect for families. All of the pools are outdoors. They range from 1 ½ feet to 4 feet deep. The area is open year-round. Hours are usually from 9 a.m. to 8 p.m., but only to 4 p.m. during the winter. One of the pools, the Azure Luxury Pool, is closed during the winter and otherwise open weekends only and is for adults only. The pool area is wheelchair accessible. Unfortunately, no inner tubes, rafts, or pool toys are available for rental. A seasonal poolside restaurant, Solaro by Wolfgang Puck, is open for breakfast and lunch from March through October. Leisurely making your way along cobblestone walkways with a painted sky ceiling overhead, steps away from more than 160 stores and eateries surrounding a quarter mile long Grand Canal. And as if all that isn't enough, there is free outdoor entertainment, too. Shopping doesn't get any better than this! The Venetian is so widely known for its outstanding shopping, it attracts well-to-do visitors from all over the world. But what many Las Vegas visitors might not know is that now the Palazzo has its own luxurious shopping mall featuring more than 60 high-end shops. The Shoppes at the Palazzo include Barney's New York, along with numerous fashion forward boutiques whose designer names read like a Who's Who in the fashion world. Barney's, Burberry, Cole Haan, and Ralph Lauren all offer children's apparel. The Shoppes at the Palazzo are open Sunday-Thursday from 10 a.m. to 11 p.m. and Friday and Saturday from 10 a.m. to midnight. The Palazzo and Venetian are conveniently located within walking distance of several other casino hotels. Or you can take a taxi or Deuce bus to get to other parts of the Strip. The easiest and quickest way to get to the Mirage and Harrah's is not to walk along the Strip but simply cross the street to Treasure Island and take the free tram to the Mirage hotel. (Caesars is to the immediate south while Harrah's is directly across the street, and from Harrah's, you can walk to the The LINQ or take the Monorail to the southern part of the Strip. Here are the top family-friendly attractions and entertainment options that are closest to the Palazzo. Terry Fator Show: A unique and highly entertaining one man show from Terry Fator, the only ventriloquist to win "America's Got Talent." LOVE by Cirque du Soleil: Any Beatles fan will love this timeless show. Pizzeria Francesco's: Individual slices or whole pies made to order. Just as good as the pizza at the Palazzo and Venetian and a lot cheaper..
Malena's Yogurt Plus: No kid will say no to this place with sandwiches, waffles, ice cream, frozen yogurt, and cookies all on the menu. Lake of Dreams: Dazzling music, light, and puppet show taking place lakeside at the Wynn every half hour from dusk to 11:30 p.m. Le Reve (The Dream): A thrilling production featuring spectacular aerial and underwater performances. Children under age 5 are not permitted. While guests at the Palazzo can shop for virtually anything their heart desires in their own back yard, we would be remiss if we didn't mention that this other huge shopping mall is right across the street. Unlike the Shoppes at the Palazzo and Venetian, the Fashion Show Mall offers merchandise at all price points, and even upscale stores like Neiman Marcus and Saks Fifth Avenue have sales with huge savings. Another plus is that the mall is packed with inexpensive places to eat. Last, but certainly not least, there is a Tix4Tonight outlet where you can pick up discounted tickets for many top shows all over town. It is impossible for anyone staying at the Palazzo to go hungry since the Palazzo and Venetian combined offer a choice of over 40 restaurants. Many of them are child-friendly, but most are not cheap. We list below those places that the whole family can enjoy that won't break the bank. Since you will probably be spending much of your time around the Grand Canal, these restaurants seem like as good as any to mention first. While many of the items on the menu are geared for adults, there are a few that will appeal to children. For example, your kids can order the All American Beef Hot Dog (on a challah bun with chili, cheddar cheese, and onions) for $13, or a pulled pork sandwich (on a challah bun with barbecue sauce, bacon, coleslaw, and a pickle) for $15 . Or they can have two grilled burger patties with American cheese and pickles on a sesame seed bun for only $10. A side order of fries costs $6, and a non-alcoholic Nutella shake costs $9. The restaurant is open daily from 11 a.m. to 1 a.m. This casual Italian eatery combines upscale décor with home style cooking. Buddy V stands for Buddy Valastro, whom you might know from TV as the Cake Boss. However, Buddy V's is where your family can go for either an individual course or a complete Italian meal including soup, main course, and dessert. Ice cream would be a good dessert choice for your kids, either alone or with Warm Nutella Cake or Apple, Oatmeal, & Raisin Crumble. Besides being open daily for lunch and dinner, Buddy's V offers a Sunday brunch, served buffet style. The buffet is served on Sundays only from 10:30 a.m. to 2:30 p.m. and costs $34.95 for adults and $14.95 for children under 10. In addition to traditional brunch fare, the buffet includes an antipasto area, heartier dishes like Chicken Parmesan and Meatballs, and desserts. There is also a special Kids Corner with kid-friendly items like chicken fingers, mac & cheese, and candy. Canaletto, like the name implies, is an Italian restaurant located among the Grand Canal Shoppes near the Gondola deck. It is a good choice for a family dinner since the menu includes several varieties of pizza. You can either order traditional thin crust pizza with a choice of toppings or calzone. All of the pizzas, which might even be large enough for the whole family, cost under $20. Hours of operation are Sun.-Thurs. from 11 a.m. to 11 p.m. and Fri. and Sat. from 11 a.m. to midnight. Casanova is a casual trattoria with reasonable prices located near the Food Court. Hours of operation are 8 a.m.-11:30 a.m. for breakfast, 11:30 a.m.-4 p.m. for lunch, and 4 p.m.-11 p.m. for dinner (till midnight on Friday and Saturday). The restaurant serves traditional breakfast fare like omelets, pancakes, French toast, and crepes in the $7 to $9 range. Juice and hot chocolate are an additional $4 each. Alternatively, for both lunch and dinner, a variety of flatbread pizzas are offered. We suggest going for lunch when the prices are slightly cheaper ($12.95 to $16.95). The Venetian Food Court located on the second level near the Grand Canal is open Sun.-Thurs. 10 a.m.-11 p.m. and Fri. and Sat. 10 a.m.-midnight. With more than a dozen places to grab a quick bite, including all of the following, your only dilemma is deciding where. This restaurant is located in the Grand Canal Shoppes near the Palazzo Parking Garage Elevators and is conveniently open from 8 a.m. to 11 p.m. (till midnight Fri. and Sat.). What child doesn't love burgers, especially when they are served in every way imaginable? Fries are on the menu, too, and your kids can choose from seven different flavors of milkshakes. But with enticing names like Blueberry Panshake, Caramel Corn, and Outrageous Oreo, choosing won't be easy. Or try this place in the morning for reasonably priced traditional breakfast fare. This award-winning brick oven pizzeria is located among the Grand Canal Shoppes near the Palazzo Casino escalators. Gourmet pizza is available in three sizes (12-inch, 16-inch, or 18-inch) with a variety of toppings. This is another upscale pizzeria that is perfect for family dining. Located at St. Marks Square in the center of the action, it is open from 11 a.m. to 11 p.m. daily. A whole pizza (or pasta plate) costs about $20. Gelato made in house daily is offered to stay or to go. Paris Baguette is a famous café and bakery where you can get sandwiches, pastries, and desserts. It is open from 8 a.m.to11 p.m. Sun.-Thurs. and from 8 a.m. till midnight Fri. and Sat. The menu at Tintoretto, which is open daily from 7 a.m. to 1 a.m., is much more extensive. The reasonably priced breakfast items include egg dishes, pancakes, and baked goods, while the lunch and dinner offerings include various meat, chicken, fish, and vegetarian entrees ($13.95-$21.95 on the lunch menu, slightly higher on the dinner menu). Gelato is available in a cup or cone in a variety of flavors. Yet another Italian restaurant where your family can share a gourmet pizza for about $20. You can either choose one of the pizzas on the menu or have it custom-made with the ingredients of your choice. Trattoria Reggiano is located near the Food Court and open daily from 10 a.m. to midnight. Located on Restaurant Row at the Venetian, this is the Las Vegas brand of the restaurant named by both the James Beard Foundation and Bon Appetit as one of America's Best New Restaurants. Hours of operation are Brunch: Fri., Sat., and Sun. only 11 a.m.-4:30 p.m., Lunch: Mon.-Thurs. 11 a.m.-4 p.m., and Supper: daily from 4:30 p.m. to midnight. We especially recommend going for brunch when the menu is filled with child-friendly items like a Maple Glazed Bacon Donut ($9),Today's Omelet ($16), Morning Quiche ($14), or a Mac & Cheese small plate ($10). Or if your kids want something different, they can have the Elvis Pancakes (chocolate chip pancakes with banana compote and peanut butter ($16--but ask for regular maple syrup in place of the bourbon maple syrup).The Mac & Cheese small plate is also on the lunch and dinner menu, and on the lunch menu, another item children should like is the blue plate special, consisting of two pieces of fried chicken, chilled spiced watermelon, and a biscuit ($15). Ice cream desserts are $10 each. Health conscious vacationers might want to try this restaurant as a welcome change from the far from healthy fare that seems to be omnipresent in Las Vegas. The Palazzo and Venetian both have their own branch of the Canyon Ranch Grill. The one at the Palazzo is located at the Canyon Ranch Spa Club on Level 3 and is open daily from 7 a.m. to 4 p.m. and Sunday for brunch from 9 a.m. to 1 p.m. Many of the ingredients are organic, and all items on the menu are shown with the caloric, fat, and fiber content. Don't worry that your kids won't like the food. There are many items on the menu that are very child-friendly. For example, for breakfast they can have whole wheat fresh berry pancakes with maple syrup ($14), organic steel cut oatmeal with milk brown sugar, raisins, and nuts ($9), or the "Healthy Elvis" ( a grilled peanut butter and banana sandwich for $12). Some of the lunch items children might like are the grass-fed beef burger with special sauce ($18) or turkey club sandwich ($13), and a fresh fruit smoothie ($8). Sunday brunch costs $29 and consists of a choice of appetizer, entrée, and dessert. Dl Toro is another reasonably priced Italian restaurant. It is conveniently located on the lower level of the Palazzo and open daily from 7:30 a.m. to 11 p.m. The restaurant offers a great breakfast special—2 eggs any style, 2 silver dollar pancakes, potatoes, toast, and 2 strips of bacon or 2 sausages, all for $9.99. Or, if you prefer, you can order an omelet, French toast, pancakes, or crepes a la carte. The lunch menu is also child-friendly, offering a wide choice of salads, sandwiches, pasta entrees, or pizza for $14.99. We recommend going for breakfast or lunch, both of which are a lot cheaper than dinner. This eatery, which is located in the Palazzo Waterfall Atrium, is open from 6 a.m. to midnight Sun.-Thursday and from 6 a.m. to 1 a.m. Fri. and Sat. Breakfast items include bagels and lox, omelets, frittatas, quiche, crepes, and pastries. Later in the day, you can get pizza, paninis, wraps, and gelato. This restaurant, owned by the same people who own the Cheesecake Factory, can be found at both the Palazzo and the Venetian Hotels. The Palazzo cafe is located near the Palazzo Theatre (which is currently dark). Grand Lux is a restaurant that will fit the bill any time of the day or evening. It is open from 6 a.m. to 1 a.m. Sun-Thurs. and from 6 a.m. to 2 a.m. Fri. and Sat. For casual cuisine in an elegant and relaxed atmosphere, this is a restaurant with something for everyone. Between 6 a.m. and 11 a.m., an Express Breakfast buffet is offered for $18.95. Or you can order a la carte from the extensive regular menu. The lunch and dinner menu (served from 11 a.m. on) has an extensive mini-bite and tapas section as well as five varieties of mini-pizzas. None of these items is priced higher than $6.95, so the price and portion size is perfect for children. Or your family can share an 18-inch pizza for $11.95 to $12.95. There are also lots of similarly priced kid-friendly items on the regularly menu like deluxe burgers or sandwiches, or the soup and half-sandwich lunch special. All of the desserts are prepared in-house daily, including a box of warm homemade chocolate chip cookies you can order at the same time you order your entrée. Then, by the time you finish your meal, they will be ready to take back to your room. Hong Kong Café, located on the Palazzo Casino floor near the Waterfall Atrium, is open Sun.-Thurs. from 11 a.m. to 1 a.m. and Fri. and Sat. from 11 a.m. to 3 a.m. Since many of the items might be too exotic for children's tastes, pick a couple of items that you think everyone will like and share. Lago Suite: 1,940 square feet with all of the features of the Siena Suite plus a choice of a piano or pool table. Some of the Lago Suites come with a second bedroom. The Luxury and Bella Suites, which are the "standard" accommodations at the Palazzo, are almost twice the size of the standard rooms at some of the other Strip hotels. The Siena and Lago Suites are the hotel's largest, most, expensive, and most lavish accommodations. All of accommodations feature Italian style décor and offer amenities like multiple flat screen TVs and soaking tubs. Many of them have sunken living rooms and separate dining areas. The main difference between the Palazzo and Prestige Suites is that Prestige guests have access to upgraded amenities, including the 23rd floor VIP Lounge. There they can enjoy a complimentary continental breakfast between 7 a.m. and 9 a.m. weekdays or brunch between 9 a.m. and noon on weekends. Snacks, hors d'oeuvres, and cocktails are available later in the day, and on Friday and Saturday evenings between 6 and 9 p.m., there is live piano entertainment in the lounge as well. Prestige guests also have access to a private check-in area, VIP elevators, and a DVD library. Additional services such as packing and unpacking, butler service and in-suite celebration of special occasions can be arranged on request. It is important to note that most of the suites have steps leading to the living room, which would make them not a good choice for guests with a mobility problem. However, the Palazzo also has handicapped accessible suites that meet the ADA standards. Wheelchairs and scooters are available for rental. Check-in time starts at 3 p.m. and checkout time is at 11 a.m. If early check-in or late checkout is desired, the hotel will try to accommodate you. Additional charges may apply. In summary, the accommodations at the Palazzo are comparable to what you will find at other 5 Diamond resorts in Las Vegas, like the Bellagio and Wynn, but with the added feature that it is an all-suite hotel. The property connects to the Venetian, which like the Palazzo, offers world class shopping and dining. Furthermore, as if the seven pools and and world class spa at the Palazzo are not enough, guests also have free access to the Venetian pools and spa. The main difference between the Palazzo and the Venetian is that the Palazzo does not have a specific theme. The Venetian seems a tad more family-friendly since there are more affordable dining options as well as family-friendly activities such as Madame Tussauds Wax Museum and the free outdoor entertainment in St. Marks Square. The hotel concierge is your go-to person for any special requests. The concierge will be happy to assist you with such matters as restaurant reservations, show tickets, and arranging sightseeing tours. The concierge's hours are 8 a.m. - 9 p.m. Sunday-Thursday and 8 a.m. - 10 p.m. Friday and Saturday. The direct phone number is 1-866-725-2990. The concierge can also arrange babysitting services for you. The Palazzo, like most Las Vegas hotels, does not have any childcare facilities on the premises. However, some of the deluxe hotels do offer assistance in arranging outside services. If you will be staying at the Palazzo and need childcare for a designated period of time, we suggest you inquire at least a day ahead of time if the hotel can help you find a qualified person. Summing Up: Is the Palazzo Child-Friendly? No hotel-casino, even those with a reputation for being more family-friendly than most, can fully meet the needs of all travelers with children. The Palazzo, despite the fact that it is not heavily promoted to families, is a place you might wish to consider, not only because the accommodations are spacious and comfortable, but also because between the property itself and other activities close by, there is plenty for children to do.